did I mention what I am knitting? 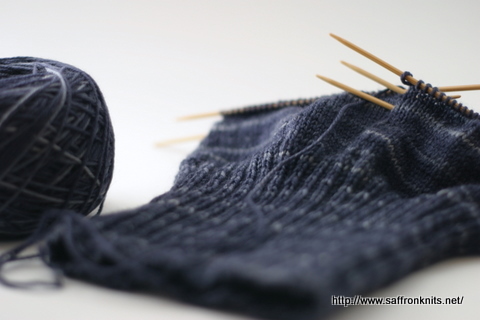 I am knitting a hat and a shawl…. Need more details than that? Ok, ok. The hat is true mindless knitting. It’s the Sockhead Hat pattern and I am used Cabin Cove Mercantile’s Ombre yarn in the colorway ‘Coal’. The yarn has this cool spiral thing goin’ on and this has been a great project when life stresses me out and I need to calm down. The shawl I am knitting is a kind of ‘fly-by-the-seat-of-pants’ project. I’m making it up as I go along and keep changing my mind on every row. The yarn is Tosh Merino Light – pretty drool-worthy stuff – awesome yardage for the price. Lots of pretty blue going on there! Looking forward to seeing what becomes of your ever-changing shawl. Yay! 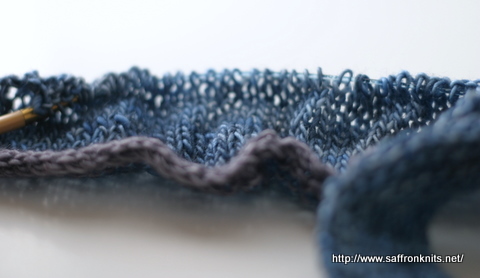 Can’t wait to see how your madtosh shawl turns out. I have to say that I am becoming a pretty big fan of that yarn.